An approach is described for use in the varietal characterization of hop (Humulus lupulus L.) varieties. The study focuses on commercial hop varieties and was timed to coincide with the 2008 commercial hop harvest in Tasmania, Australia. 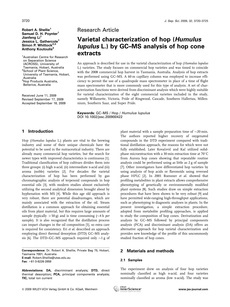 Analysis of hop extracts was performed using GC-MS. A 60 m capillary column was employed to increase efficiency to permit the use of a quadrupole mass spectrometer in place of a time of flight mass spectrometer that is more commonly used for this type of analysis. A set of characterization functions were derived from discriminant analysis which were highly suitable for varietal characterization of the eight commercial varieties included in the study, namely Willamette, Victoria, Pride of Ringwood, Cascade, Southern Hallertau, Millennium, Southern Saaz, and Super Pride.